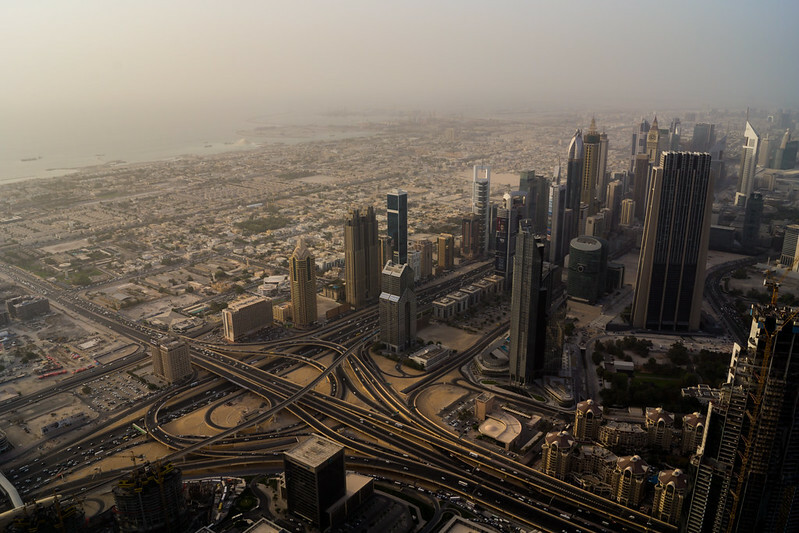 Dubai – It’s easily one of the most interesting cities in the world, if anything for how quickly it went from a small spot on the coast in a desert country to a massive city that attracts the craziest projects and some of the wealthiest people. It’s given the world the largest mall, the tallest building, an indoor ski-slope, beaches, luxury resorts, and so much more. But really, all of Dubai isn’t about the glitz and glam that the more recent build-out of the city is all about. There is still the central core of the city, along Dubai Creek, that is very much not high rises or glass-walled buildings. Granted, the “old” Dubai has become more or less just another one of the tourist attractions for the city, but it at least at times feels like the you’re in the Middle East. My experience isn’t as varied as some, having been to only Dubai and Bahrain (several years ago), but you still get that feel. 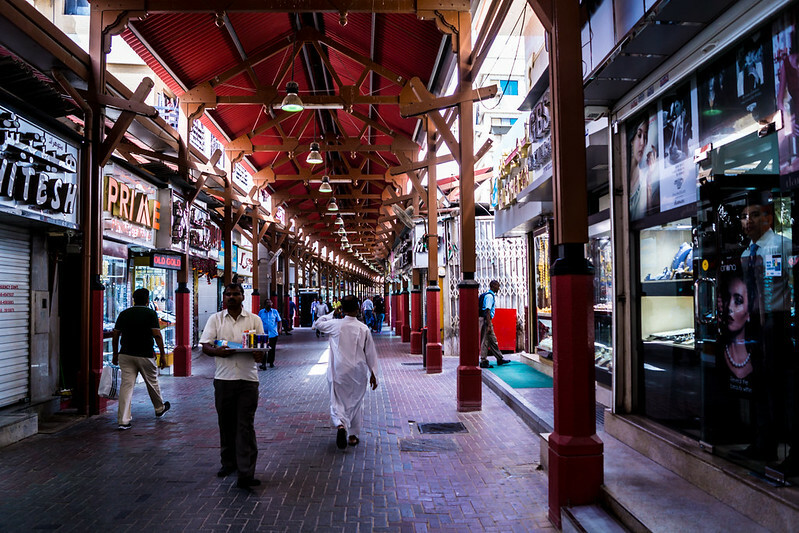 For most travelers, I think that is what they will like about Dubai – it’s safe, it’s modern, but still allows you to have that Middle East experience. Plus, despite the pricing, you will have a good time when the sunsets! Having arrived in Dubai in the middle of the night on Kenya Airways, I slept in fairly late at my hotel for my stay, the DoubleTree Hotel Jumeirah Beach. I wasn’t sure at first about what I would try to do on this first day, and since I had two other days to partake in activities, I didn’t feel a lot of pressure to rush around. Besides, as I walked out of the DoubleTree that first day late in the morning, the heat really hit me! Of course, I was in Dubai in June, which is probably the exact time of the year where you would think would be the worst time to visit. Thankfully the distance to the tram station was really no worse than a 10 minute walk, but even in 100F+ temperatures, you feel it quick. 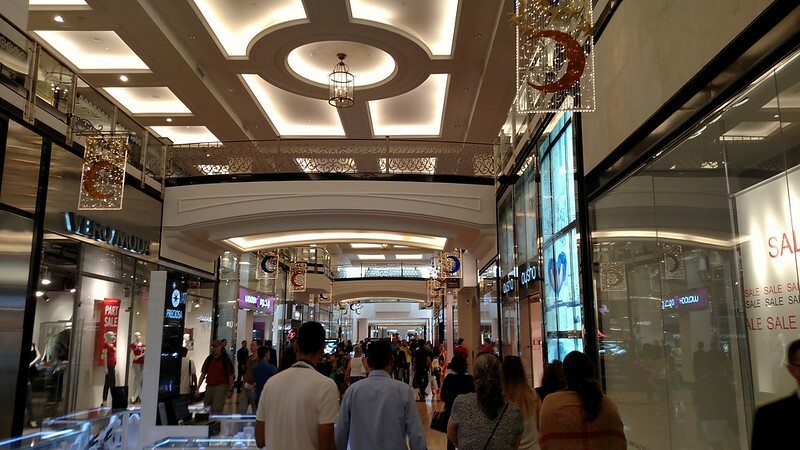 Given the outdoor temperatures, I decided to spend most of the day checking out the absurdness that is Dubai’s malls. 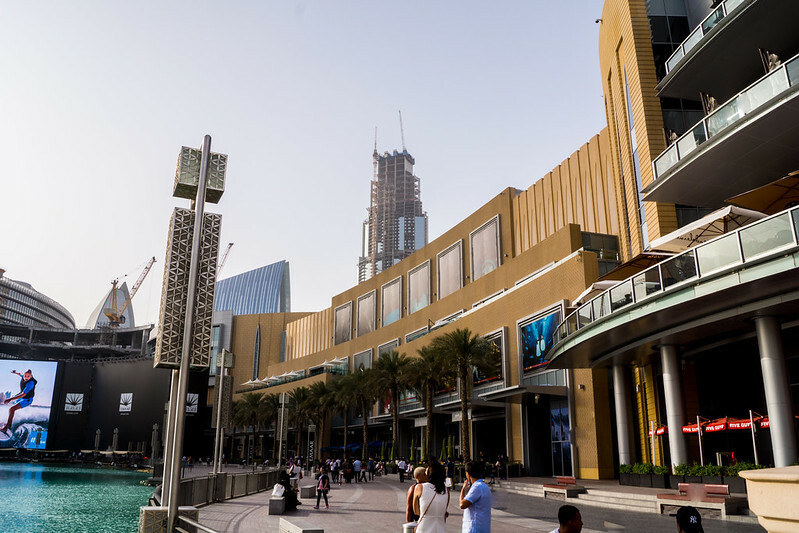 Starting small, I found myself at the Dubai Marina Mall, which conveniently had a tram stop. This mall was definitely small on the “Dubai Scale”, however it would still rank as a fairly large mall back here in the US. Most of the stores were fairly normal too – the one that really stood out though? Borders. 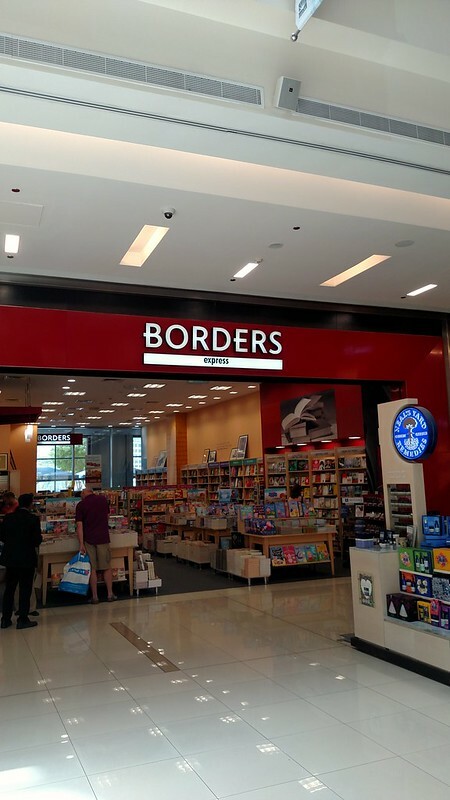 The bankrupt bookseller still soldiers on in the Middle East (I do get that it is more than likely a licensee who is continue to license the brand from whomever bought up Borders when they shut down). I did not spent a very long time here, but I did find myself having to buy a new razor here after realizing that I left mine somewhere in Africa…thankfully the Gillette Mach 3 can be bought anywhere! 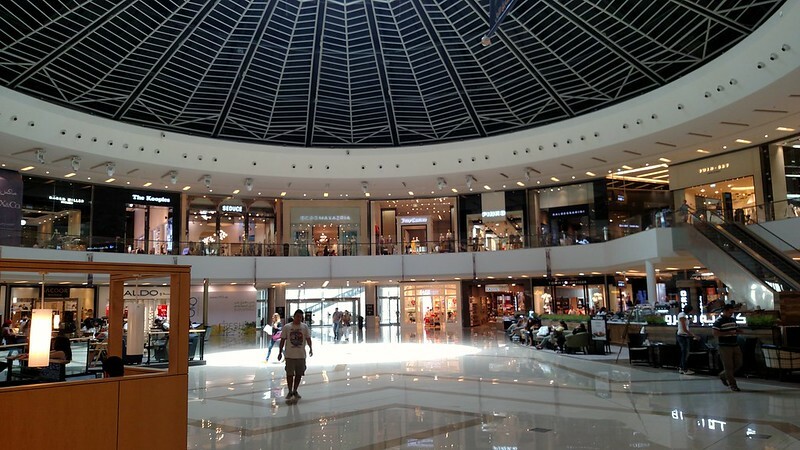 Up next was the Mall of the Emirates, of which I headed towards from the Dubai Marina Mall in the back of a taxi. This proved to be cheap enough and fairly efficient and best of all from having to take the tram to one of the nearby metro stops. The Mall of the Emirates is properly impressive. The Mall itself is amazingly massive, and I’ve been to large malls here in the US (Looking at you Mall of America). Plus this is where you find Ski Dubai, the world’s most unlikely ski-slope, which I’ll get into a bit later. The first order of business though at this mall was getting a local SIM card from the Etisalat shop. The process of getting the SIM was fairly painless, as well as the pricing; for AED55 I was able to get a very good amount of data as well as a little tiny bit of call time in the event that I needed to make a quick phone call. 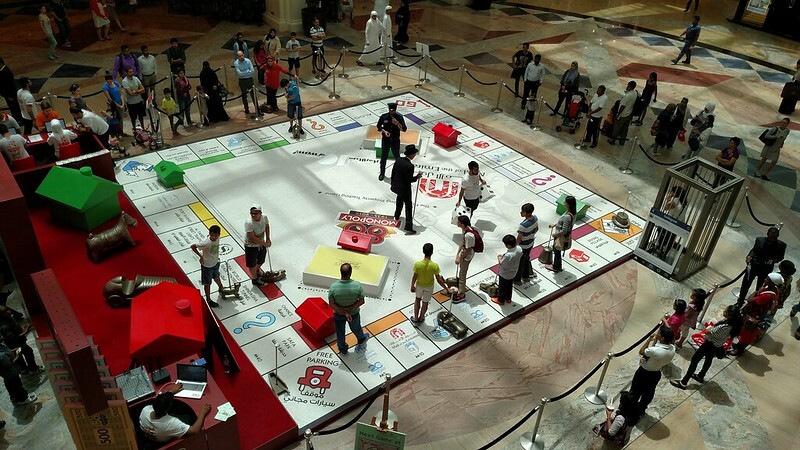 I found myself watching life-size Monopoly for a bit being played in one of the atriums, amazed at finding a Vertu store (Google it, if you don’t know what it is), staring through the windows at the frozen winter wonderland at Ski Dubai, and just walked as much as I could before realizing I was going in circles. 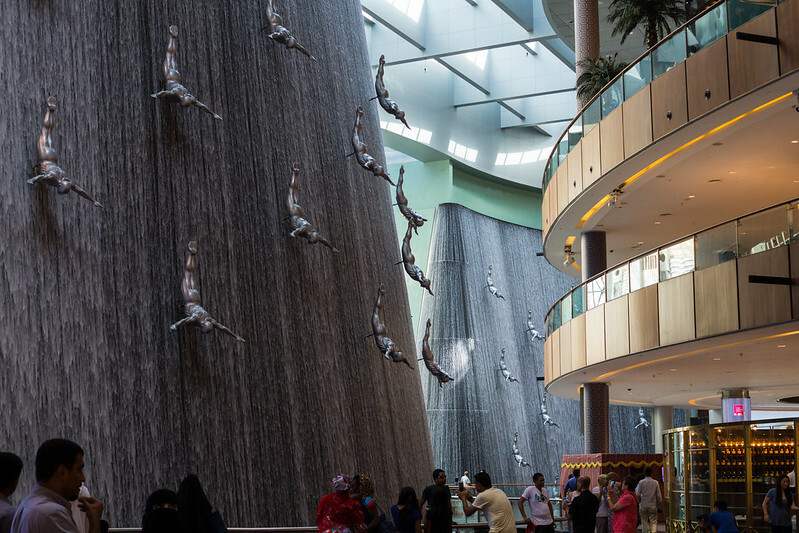 From the Mall of the Emirates, it’s very easy to use the Dubai Metro system to the world’s largest – the Dubai Mall. Just in case the Mall of the Emirates wasn’t large enough for you, there’s this place, which is somehow even larger! In fact, it will probably be the largest for a good long while, as it appeared that they were adding even more space by adding a new wing to the Mall! Dubai, really is the perpetual construction site. I will say that arriving via the metro was interesting in that the metro station is quite the hike to/from the mall. One must traverse a series of sky bridges that make you feel like you walk a mile before you actually enter the mall. It could be worse though; it could be all outside. Once inside the mall I did as what I did with the other two malls – walked around and just took it in. I browsed at a few shops (almost buying things in the process), watched the sea-life swim around in the very large aquarium, checked out the multi-story indoor waterfall, had a snack, and plotted my next move. What was that next move? The Burj Khalifa of course! 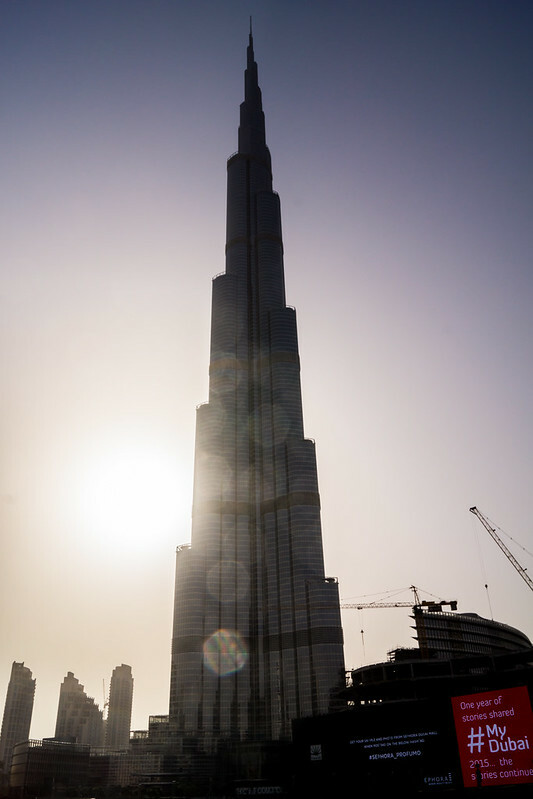 The world’s tallest building is conveniently located at the Dubai Mall, or more appropriately the entrance for the observation deck. I had pre-purchased a ticket, so there wasn’t too bad of a wait and even the line wasn’t that bad to get through. Just a lot of corridors as you snake your way from the mall to the base of the Burj and then up to the top. 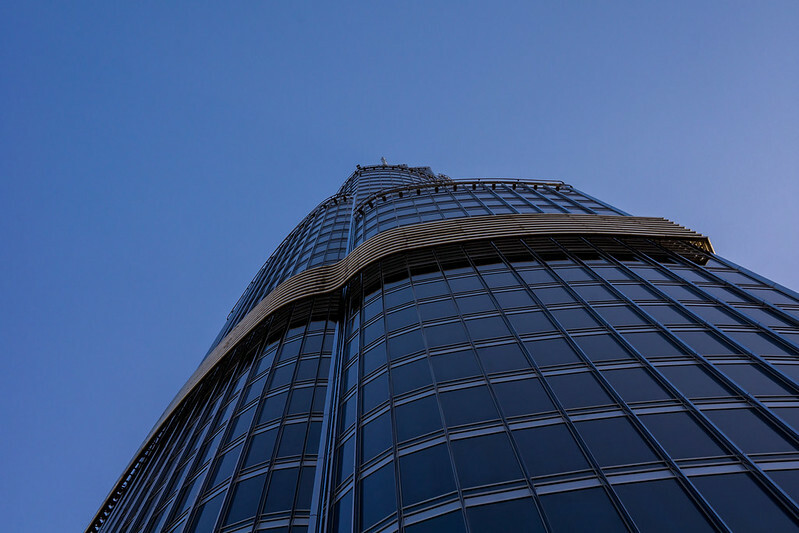 It doesn’t take long to reach the observation deck on the 124th floor, but once there you can make your way to the relatively small observation deck that faces northward and and spans roughly about 90-degrees in either direction. 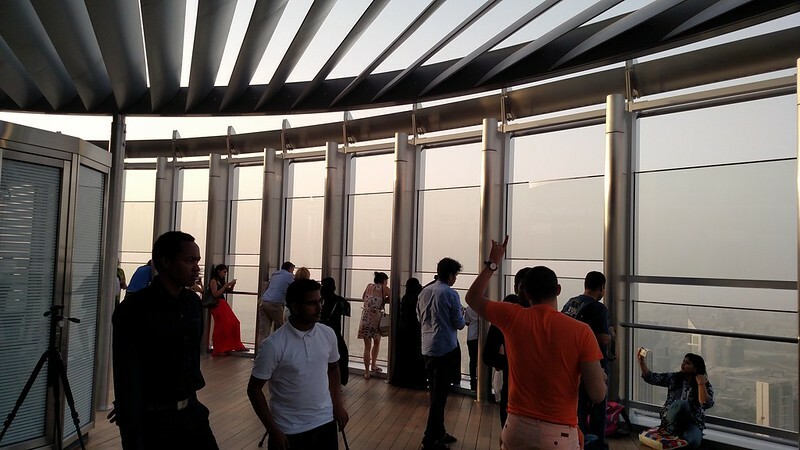 Large glass panels are there for safety, although there are cut-outs in the glass, so you can get a photo of Dubai, minus the glare. I did spend a good bit out here, although one couldn’t make out really any of the famous landmarks due to a haze. I was able to see a little bit of “The World”, though. And Of Course, There’s Me! On my second full day within Dubai, I made sure to see the “old” side of the city, away from all the modern and recent developments. Getting into the old city was easy enough; I was able to take the metro all the way from my hotel to a short walking distance to museums, the creek, and shops. 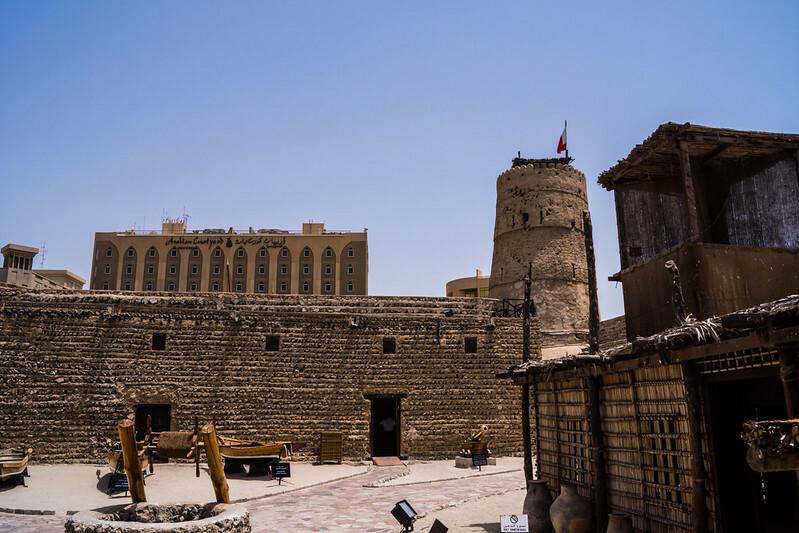 My first destination was to walk the 15 minutes or so from the Al Fahidi Metro Station to the Al Fahidi Fort, which houses the Dubai Museum. Walking these streets definitely reminded me of my first experience with the Middle East, Bahrain, in 2012. Unfortunately unlike when I was in Bahrain, I was here when it was the middle of the summer. The museum made for a good refuge from the sun for a bit, and after touring the exhibits (nothing super notable, but does go into the history of Dubai especially, pre-oil) I made my way for Souq #1. 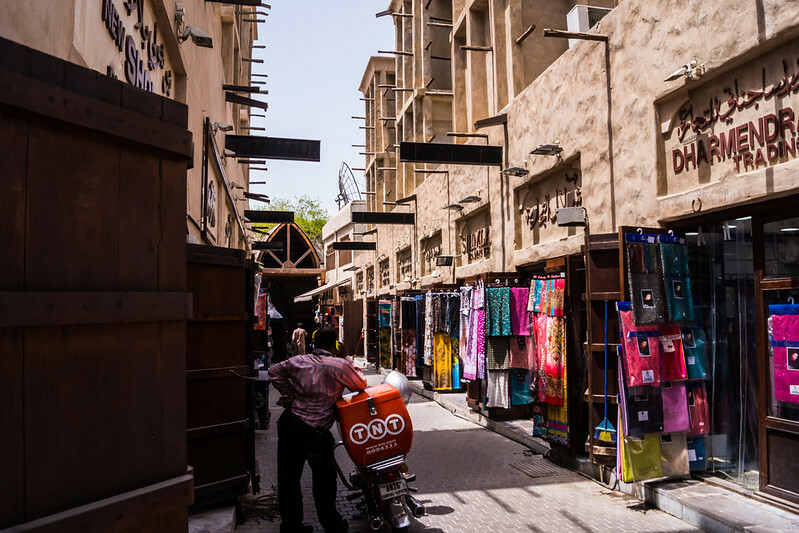 The Textile Souq, which is located right along side Dubai Creek, is a more modern outside corridor with shops lining each side selling primarily woven products. 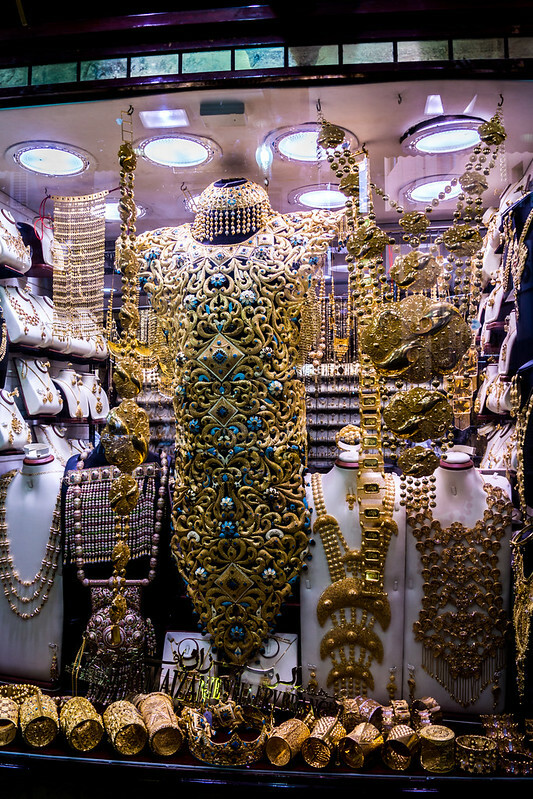 Sure, none of the items are probably made in Dubai, and everything is probably marked up significantly, but if you like to haggle it can be fun. I know I did when I passed back through in the afternoon, and walked away with two scarves. As always with places like this, you will have the vendors try to do everything possible to get you into their shops; you just have to remember that you can keep walking and if you go in and don’t like anything, you can always walk away. Don’t get trapped! 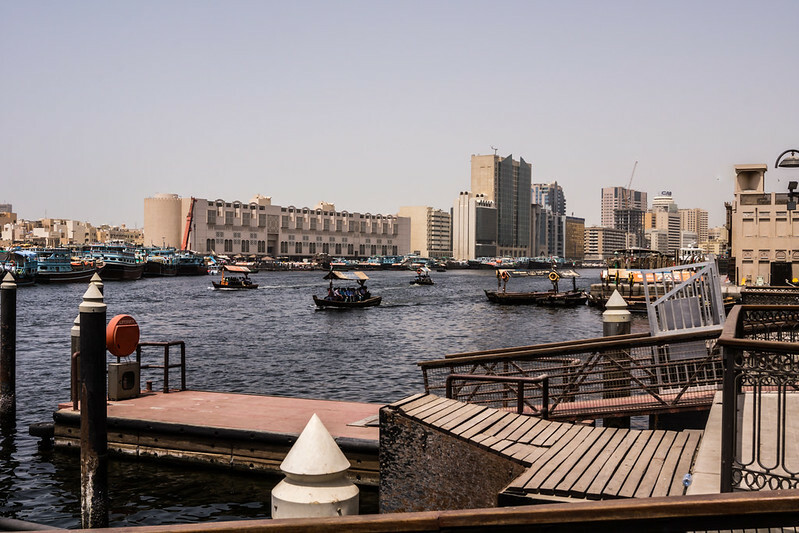 One is also afforded the possibility of crossing Dubai Creek using an abra, which is a small wooden boat that features two benches running along the centerline for people to sit for the short crossing of the creek. This is considered public transit and is very cheap, coming in at something like 1AED (or roughly US$0.25). 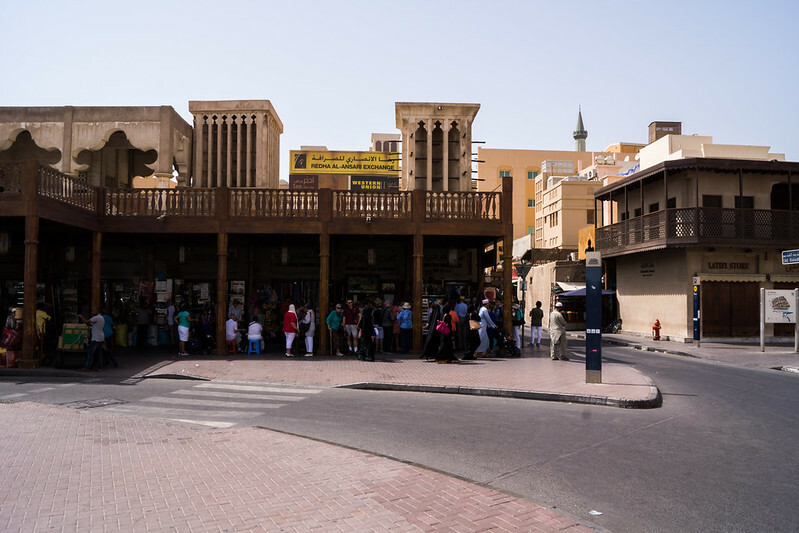 If you’re doing the Souq circuit, then the water taxi is good from going from the Textile Souq to the Spice Souq, which is more or less right across the water. When I walked up, I saw crowd after crowd of tourists on tours, so I quickly started walking elsewhere, by going down some of the back alleys and passageways and getting away from the crowds. Did I find anything too surprising? No, but you do get to see everyday people go about their life and no one really tried to lure me into a shop. It was nice! 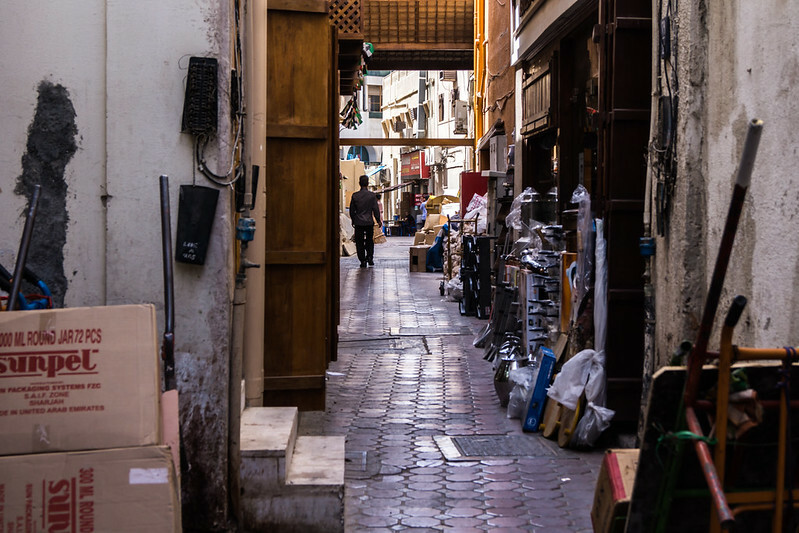 I walked around for a good bit, more or less walking along random city streets and eventually wound up at Naif Souq, which wasn’t anything too remarkable other than it was indoors. From there it was to the Gold Souq, which aside from just being interesting at looking at all the gold in the windows (although I wonder how much of what was on display was real). The only annoyance here is that several times as I walked through did people trying to sell me beverages approach me to buy something. As with anything like that, it’s usually best to just keep on walking. Skiing. Dubai. 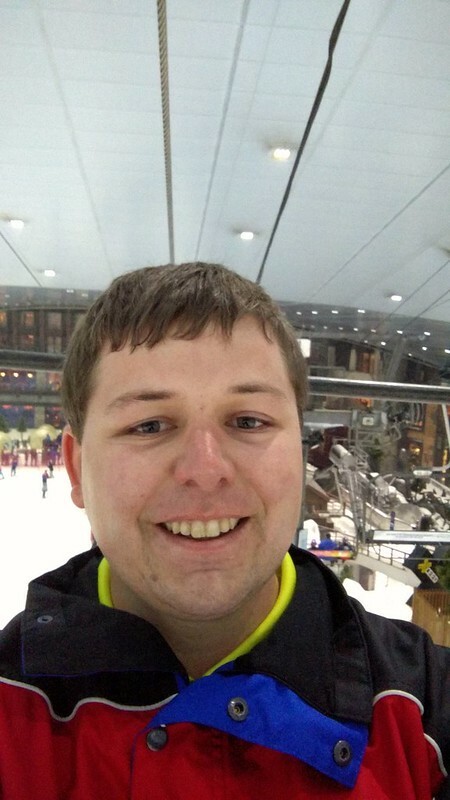 You’ve probably heard before that Dubai has an indoor ski-slope in one of the malls, and I’m here to tell you that it’s very true! The Mall of the Emirates, features this indoor winter wonderland, and I knew that I just had to go and do experience this first hand. Especially after spending the previous day out in the heat, I knew that this would be a great way to cool down! Paying my entry fee, I changed into the appropriate winter gear that they provide – snow pants, a jacket, boots, and gloves. Obviously, the average resident or visitor to Dubai isn’t going to have these things when it is 108F outside! Once you kit up and stash everything else in a locker, you can proceed “out” into the the snow. Now, to actually go skiing, you have to first demonstrate that you are proficient before they will let you go down the slope, which means there aren’t many folks actually skiing or snowboarding. They do offer lessons, but on top of all this there are plenty of other activities to keep people happy. You can ride the chair lift all the way to the top and back down (or get off halfway and enjoy a snack at a cafe), there are snow activities to keep you otherwise occupied, although for me the star attraction was the…Penguins! From there, they take you into the encounter area, which is a small area for your group to sit around while they bring some of these awkwardly awesome birds out. The group is small – mine had maybe 7 people in it, so you definitely are crowded in. The King Penguins were brought out, two of them, for us to interact with. There was the “usual” show the animal off bit, before we started our encounters. First they had people sit on a “rock” in their groups (Ha! I was a group of one!) 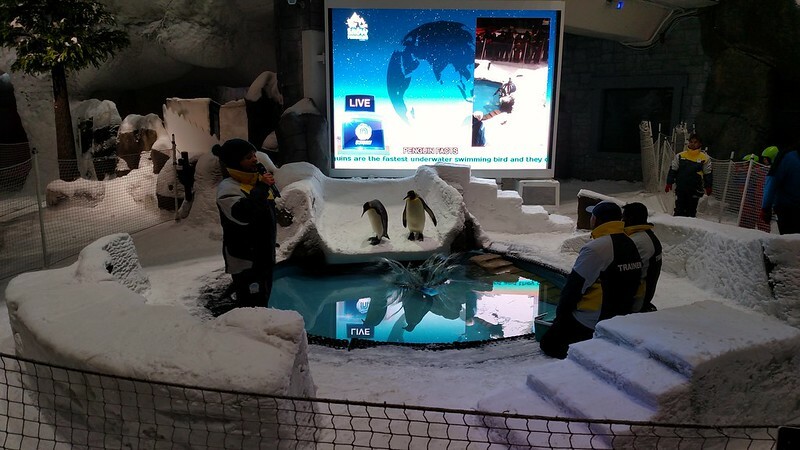 while the penguins hopped around you and stood on each side of you. Naturally, this was a photo-op for their photographer. Once everyone had been through that, it was time to “hug” the penguins. Basically, in the end, it may have been one of the happiest days of my trip! Dubai, as a global city, won’t disappoint you when it comes to dining and drinking. Well, maybe the prices for drinking, but some places make up for it! While I did eat at the DoubleTree for some of my breakfasts and a dinner, I made sure to try some other places as well throughout Dubai. Sure, I could have gone and went to a Texas Roadhouse or any other established American chain restaurants (because they really are everywhere), but what is the point of that when you are traveling? I always try to avoid those as much as possible, although usually a McDonald’s makes it through the cracks. 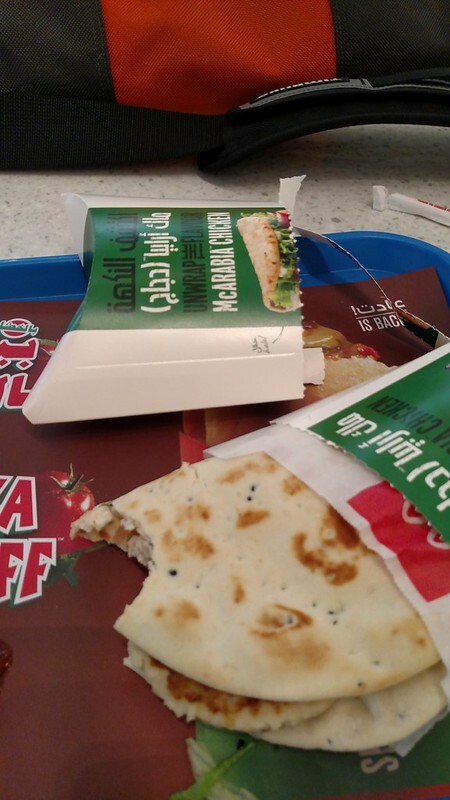 In this case, that meant getting a McArabia Chicken in the Mall of the Emirates after spending time at Ski Dubai. At least it’s a menu item that they don’t have in the US! Starting with the most important meal of the day, Breakfast; the one morning that I did not eat the generally good offerings at the DoubleTree was when I walked about two blocks down the street from the hotel to PAUL Bakery and Cafe. It turned out that PAUL is a chain of French bakery-cafes, featuring table service versus the counter service that you might find at a Panera Bread or Corner Bakery Cafe in the US. 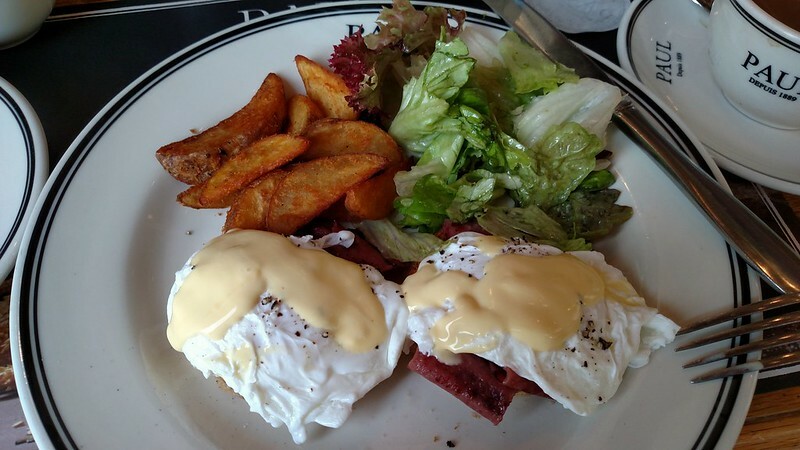 I had ordered the Eggs Benedict, which is what I always use to judge a place on their breakfast/brunch, and it pretty much did not disappoint. It also wins on location, as it was only a 5 minute walk from my hotel – making it easy to escape eating at the hotel. 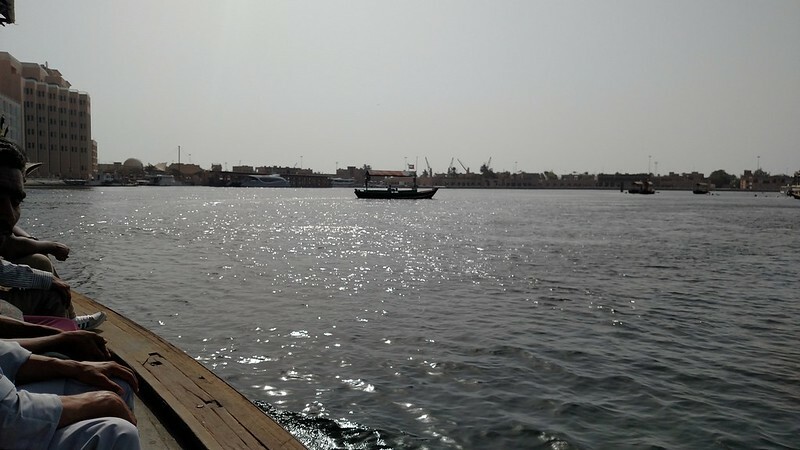 Down on the creek, I had decided to visit the restaurant Bait Al Wakeel, which was noted in many places, but with that comes knowing that you’re at a tourist establishment. 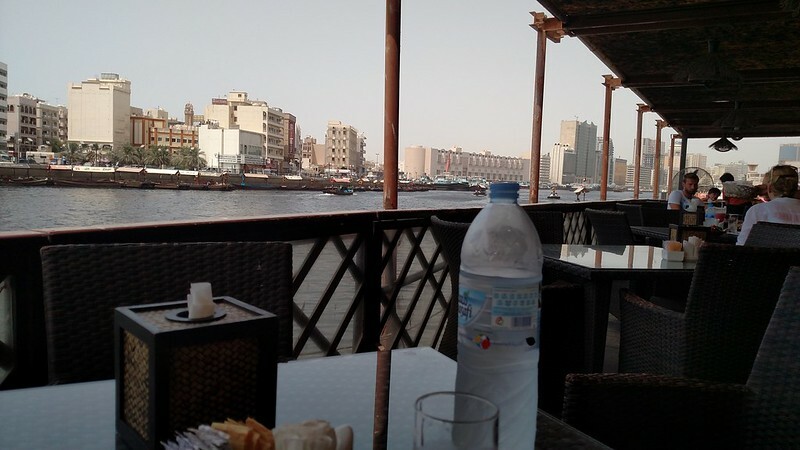 That being said, it does provide fantastic views of the Dubai Creek, and in the shade! That alone is probably the most important part of this restaurant when it is over 100F outside. I kept my meal light and for the most part focused on figuring out how to consume as much water as possible. Also, while this place is pretty touristy, when I decided to stop by in the early afternoon, it wasn’t busy at all, with only a few tables occupied. This meant I was able to secure a table right up next to the creek and be able to watch all the water traffic! 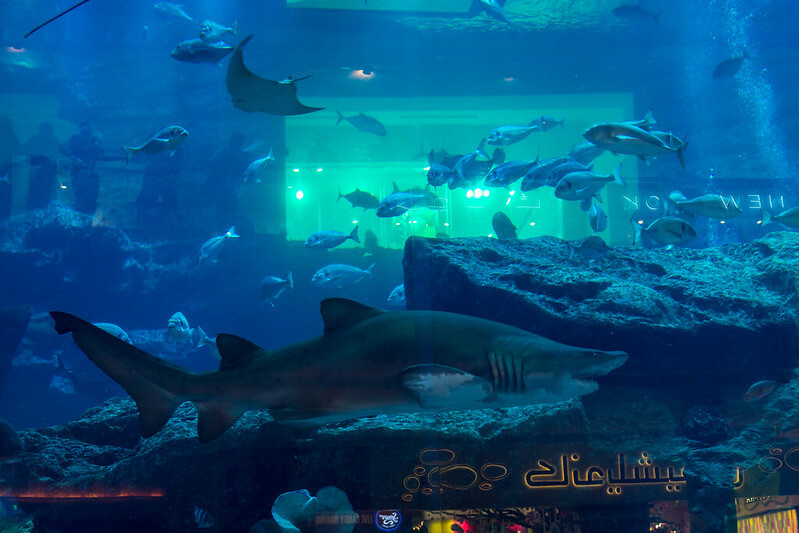 At the Mall of the Emirates on my first day, I tried the restaurant Al Hallab Restaurant & Sweets. This place is one of the many food court areas within the mall, although this food court was primarily sit down table service establishments with both “indoor” and “outdoor” seating. Lebanese food is the name of the game here, and the service is quick. I believe I had tried the Arayes – because why wouldn’t I get something that included lamb and pita bread?!? 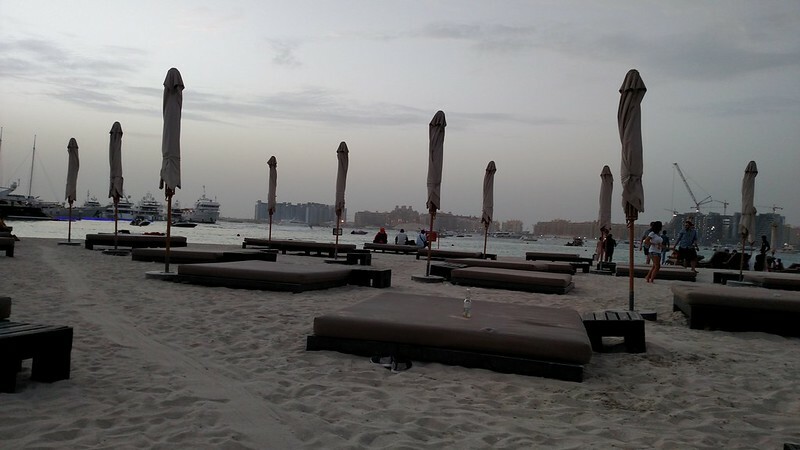 My final night in Dubai, since I had limited time and wanted to get one last night in before getting on my middle of the night departure back to Nairobi, I decided to head to Barasti Beach. Part restaurant, part club, part beach front bar, Barasti is definitely one of the most well known places to imbibe in the city as well as probably one of the largest. 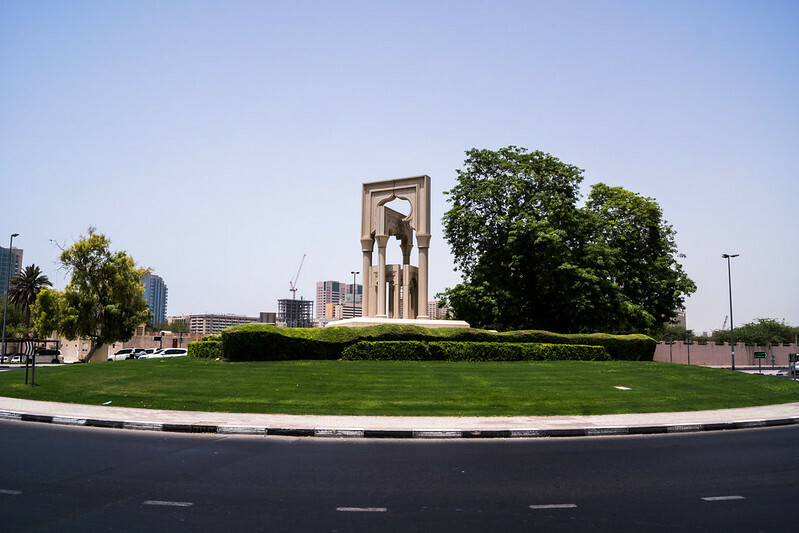 Located the Le Meridien Mina Seyahi Beach Resort & Marina, it was very easy to get to from my hotel via the Dubai Tram and alighting at Mina Seyahi Tram Station (located right across the street). Here, I kept it simple: burger and fries. Yes, how very American of me right? Well when you come here, you aren’t going to find “local” food on the menu. Plus, word was they did a decent burger, so I went for it. I was not disappointed. The other thing that didn’t disappoint? I showed up and it was happy hour still! Hooray for marginally cheaper beer! And that is the thing with Dubai, if you choose to drink, it’s going to be expensive. Why is this? Well, keeping in mind that the UAE and Dubai are for the most part fairly conservative and that means alcohol is viewed as less-than-favorable. 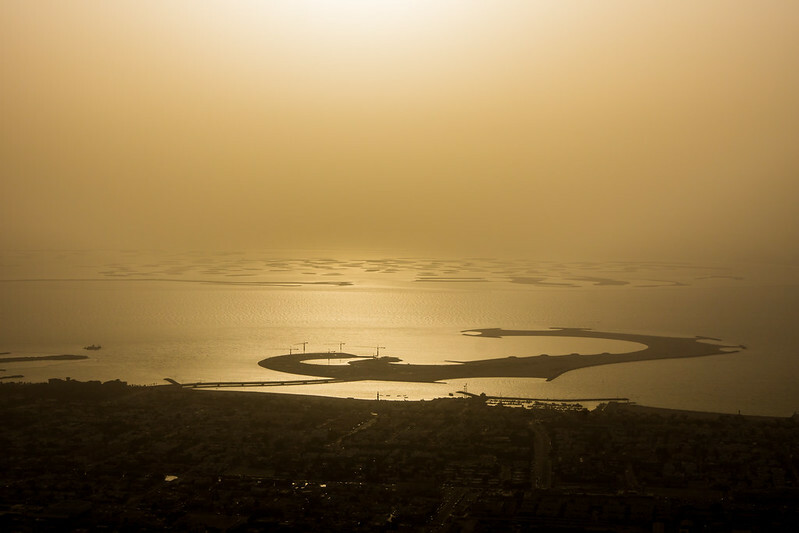 However, unlike some Emirates within the UAE, Dubai decided to allow for the establishment of bars and serving of alcohol, just with some caveats. For starters, you won’t see any being served outside of a hotel – this is the only place where bars can be established. On top of this the Government levies high taxes/tariffs on alcohol as well leading to abnormally high prices. While I’m used to paying US$5 for a so-so beer here in the Florida beach town I live in, for example you can find yourself paying over US$10 for a single Stella Artois. And don’t even think about mixing drinking and driving – even the slightest bit in your system will be considered drunk driving! Be smart and and make sure you use a taxi, Uber, or take public transit…It’s easy enough and you won’t run the risk! Other nights I visited a number of other establishments including Girders & Girders Garden, The Underground, and McGettigan’s. Girders & Girders was an easy choice as it was just a block away from my hotel at the Ocean View Hotel. Located on the second floor, it’s accessed via stairs on the outside of the property. Hardly anyone was sitting in the outdoor portion, and nearly everyone was inside where there was some live music happening. The place itself gets pretty loud, and judging by the crowd this definitely seems like a popular spot. I only stayed for a few drinks before requesting an Uber to check out another spot. Given the number of British expats who live in Dubai, as well as those who like all things British, it’s no surprise that you will find a “British pub” in Dubai. In my case, I made the trek to The Underground, located in the basement of the Habtoor Grand Beach Resort & Spa which itself it located on the North end of the Dubai Marina. It was a little tricky to find as there was not any signage upon entering the hotel lobby, but with asking a staff member, I made my way downstairs and through a few corridors before I wound up at the “pub”. Now, given the name of the place, I think you can guess how it is themed. The bar itself is inside what I think is supposed to be an “underground car”, although part of me thinks they just painted a camper trailer to look like one. Service was a bit of a miss and aside from the band playing (who set up shortly after I got there and I’m pretty sure was the band that was playing at Girders earlier in the evening! ), this place just didn’t feel like it had a great vibe. Almost felt a little cold, but I still hung around for a few pints while I enjoyed the music. Finally, we get to McGettigan’s, which as you might guess is an “Irish Pub”. Although in reality it’s only that in name only, as there isn’t anything too ‘Irish’ about the place. 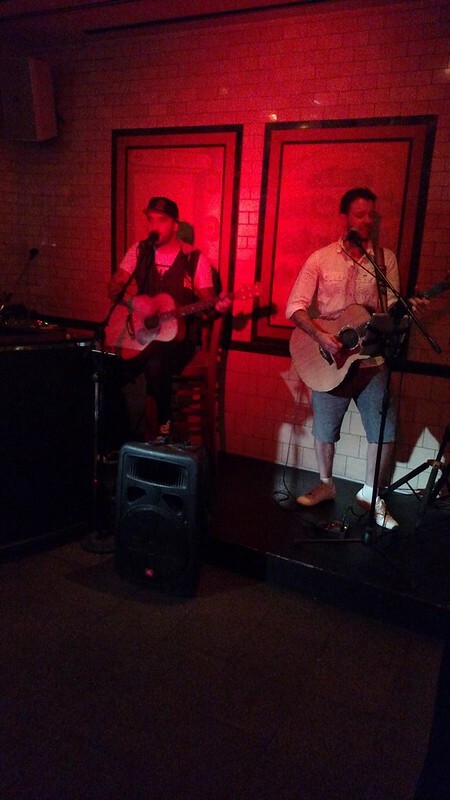 It didn’t have really any of the traditional Irish Pub decor, and it was separated into two areas one darker area that had live music and a brighter area that seemed to be more for the casual drinking with friends type of night. Overall, there was a pretty good crowd, but the night ended what seemed all too soon; only able to get a single pint in before last call was sounded. Really the only problem that I had with this place was getting to here and back to my hotel in a Taxi. The drivers in both cases didn’t really know where they were going and despite me trying to show them on Google Maps, well let’s just say I more or less round up taking very circuitous routes in both cases. Another reason why Uber is so great…and they do have it in Dubai! The only reason I didn’t that night? The wait times for an Uber coupled with surge pricing. I’ve got to say, Dubai definitely lived up to my expectations. Everything was pretty much over the top; the malls, the buildings, attractions, and even the temperature. I was glad that I was able to see some of the “old city” and although it got a bit touristy at times, it’s always good to see how the true majority of locals live versus the life of the Western expats. The one thing that did surprise me though about Dubai was just how easy it was to get around at times. 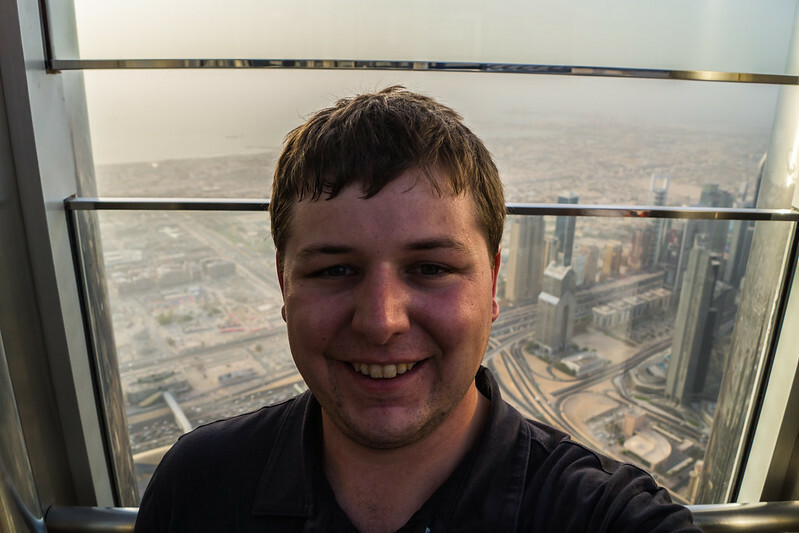 Between the Dubai Metro, Tram, Taxis and Uber, I was pretty much able to get around everywhere in the city without too much hassle – and minimal time outside. Granted it still isn’t as easy as say somewhere like Amsterdam for getting around, but I think part of this is also just how spread out Dubai is – even my middle of the night taxi ride from the airport to the hotel took a good while. There is really only one thing that I would do differently if I were to go back anytime soon to Dubai: go in the winter. Seriously, going in June was a little bit of a mistake since it gets way too hot way too early. Having been to the region before in January, I can say it is most definitely better to go then when it can actually get slightly cool outside. On the plus side, the hotels are a bit cheaper in Summer and it makes Ski Dubai seem that much more worth it! 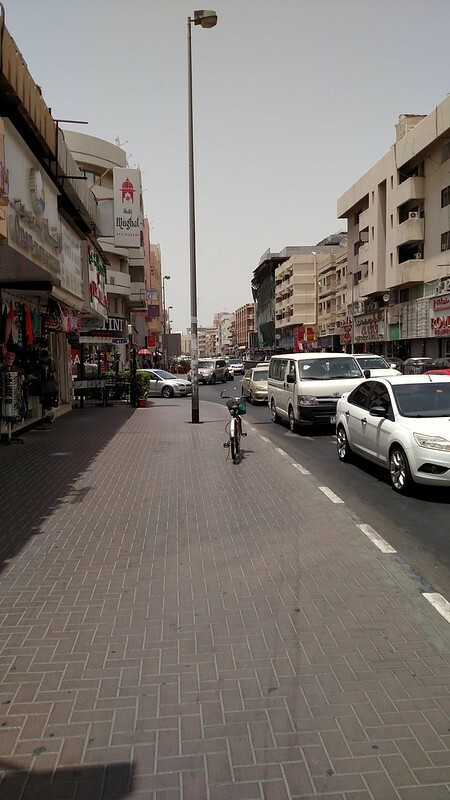 This entry was posted in Dubai, RTW, Travel, Trip Report. Bookmark the permalink. Follow any comments here with the RSS feed for this post. Post a comment or leave a trackback: Trackback URL.